Telecommunications company Avaya filed for Chapter 11 bankruptcy protection on Thursday to reduce its debt load of about $6.3 billion but said it would not sell its call center business, which it had tried to do last year. The bankruptcy underscores the challenges telecommunications companies face as they transition to software and services from hardware. Early last year, Avaya had planned to sell its call center business but did not reach a deal with buyout firm Clayton, Dubilier & Rice, which had been in the lead to acquire it for about $4 billion. Avaya said it must focus on its debt and that a sale of the call center would not maximize value for its customers or creditors. It is still negotiating deals to sell parts of its business. The company is hashing out terms of a restructuring deal with creditors. The original goal was to have one in place before bankruptcy, but an agreement was not reached. The company said an affiliate of Citigroup Inc would provide a $725 million loan for up to a year to fund its operations during the reorganization. Avaya said the loan was needed to reassure jittery vendors who had been shortening payment periods and reducing credit terms in recent months on fears about the company's financial health. 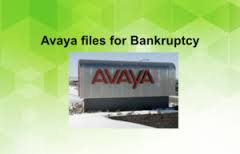 "Absent additional financing, I believe the debtors could be forced to liquidate on a highly expedited basis," said a court filing by Eric Koza, a managing director at the restructuring firm Zolfo Cooper, which has been advising Avaya. Koza also said the money was needed to pay for administrative costs of bankruptcy, "which are expected to be significant." Avaya faced a deadline at the end of January in agreements with creditors to address its debt or potentially default. The Santa Clara, California-based company has been burdened by debt stemming from an $8.2 billion buyout in 2007 by private equity firms Silver Lake Partners and TPG Capital, with $600 million coming due in October. Interest expense of more than $400 million a year has been pushing Avaya into losses. At Sept. 30, Avaya owed its pensioners $1.7 billion. Avaya's revenue fell to $958 million in the fourth quarter ended on Sept. 30 from $1 billion a year earlier, according to financial results released Thursday. For the fiscal year, the company posted a net loss of $750 million.